I just found a better and simpler way to make pasta with vegetables. Everything cooks in one pot and you don’t even have to drain the pasta. With a small amount of water the pasta and vegetables all cook in the same pot. I love it. Be sure to keep the water boiling (not too high or too much water will boil away). If too much water boils away, you can add a little more water as needed. A timer is really helpful so you can set it for the pasta cooking time and then keep an eye to know when to add the veggies. When you add the broccoli, just open the lid briefly, toss the broccoli on top, and quickly close the lid. The broccoli will steam right on top. Add more or less parmesan. I like it with three tablespoons. 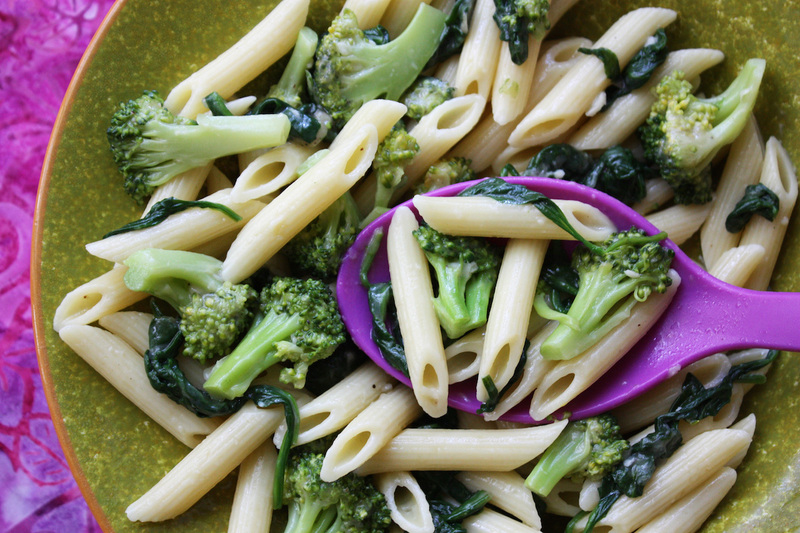 4 Comments on "15 Minute Veggie Pasta"
Made this today and, oh my goodness, it is so good. The only mistake I made was not cooking the pasta (I used farfalle) about a minute more. I will make this again, maybe even tomorrow, and do a better job, I’m often an impatient cook! Thank you for this recipe. I am so glad to have found your site. I love your take on healthy cooking. I have printed about 6 recipes and I am going to start cooking today. It’s so nice the way your recipes print. Just one page and no extra crap. Thanks so so much for doing this. You haven’t posted anything on YouTube in two years . I was just wondering about you . I can never seem to find the time to make more videos (too busy with my own cooking every day) and the responsibilities of being alive… maybe some time down the road.